Among the conducting polymers, polyaniline (PANI) and polypyrrole (PPy) are the most popular. According to the Web of Science, more than 10,000 papers appeared in the past 30 years on various aspects of chemistry, physics, and engineering of PANI. This is due to the cheapness and easy availability of raw materials, ease of synthesis, good environmental stability, high electrical conductivity and simple doping/dedoping chemistry. The polymer–metal nanocomposites are promising candidates based on the fact that the small sized particles enhance the properties while the polymer matrix offers flexible functionalities to control host-guest interaction to ensure the growth and distribution of metal nanoparticles. Organic-inorganic hybrid materials prepared by sol-gel approach have attracted a great deal of attention in material science. Organic polymeric part of the composite provides mechanical and chemical stability whereas the inorganic part supports the ion-exchange behavior and thermal stability. Such modified composite materials can be applied as electrochemically switchable ion exchanger [1, 2] for water treatment, especially water softening. The synthesis of hybrid ion exchangers with controlled functionality and hydrophobicity could open new avenues for organometallic chemistry, catalysis, organic host-guest chemistry, analytical chemistry [3-5], hydrometallurgy, antibiotic purification, separation of radioactive isotopes and large scale application in water treatment and pollution control [6, 7]. Thus, organic-inorganic hybrid materials are expected to provide many possibilities as new composite materials. Accordingly, the hybrid can be used to modify organic polymer materials or to modify inorganic glassy materials. In addition to these characteristics, the hybrid materials can be considered as new composite materials that exhibit very different properties from their original components, that is, organic polymer and inorganic materials especially in the case of molecular level hybrids. Thus, the synthesis of polymeric/inorganic composites has received a great deal of attention because it provided new materials with special mechanical, chemical, electrochemical, and optical as well as magnetic properties [8-11]. behaviour and some important chemical applications in the field of ion exchange, ion-exchange membrane, and solid state electrochemistry . Goward et al. have reported that polyaniline Zr(IV) tungstophosphate nanocomposite ion exchanger was used for the selective separation of Pb2+. The literature reveals that several three-component ion exchangers, that is, zirconium(IV)iodooxalate, zirconium(IV)phosphosilicate, zirconium(IV) phosphoborate, and zirconium(IV)tungstophosphate , behaviour studied for their synthesis, ion-exchange behavior, and analytical applications. This work deals with the synthesis, characterization, and the study of ion-exchange properties of polyaniline Zr(IV)iodate as a new ion exchanger. Zirconium(IV)iodate ion exchanger was prepared by sol-gel method in which zirconium oxychloride (0.1 M) and potassium iodate (0.1 M) were mixing at the flow rate of 0.5 mL min−1 . To maintain the pH ~1 for resulting mixture, adding HNO3 with constant stirring using a magnetic stirrer at room temperature. The gelatinous precipitate was occurred and filtered off, washed thoroughly with distilled water to remove excess acid and was dried in an oven at 60 °C. Polyaniline was prepared by in situ chemical oxidative polymerization technique using potassium persulphate as an oxidant for aniline. 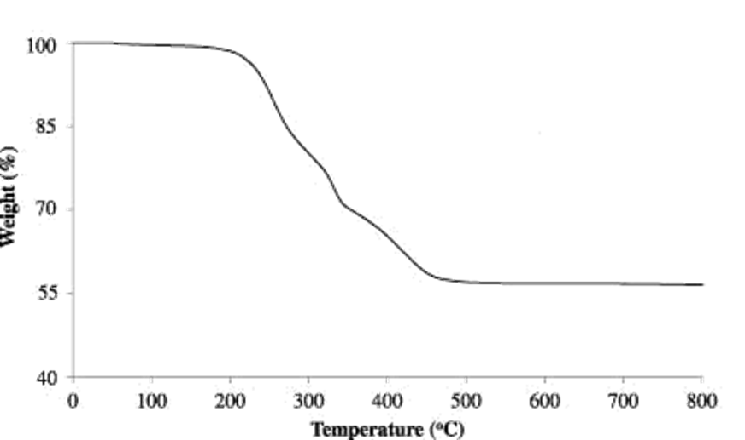 Polymerization was kept at low temperature (5-8 °C) by drop-wise addition of the oxidant (0.1 M in 1M HCl) to the continuously stirred solution of aniline (0.1 M in 1M HCl) for an hour. After that polymerization, it was allowed to proceed further after kept for few hours in a refrigerator. The formed precipitate was filtered, washed with distilled water, and methanol repeatedly until the filtrate became colourless, and was dried in an air oven at 60 °C. The dried dark greenish powder of polyaniline was ground into a fine powder. The composite ion exchanger was prepared by the sol-gel method using polyaniline and inorganic precipitate of zirconium(IV)iodate [21-23]. In this process, the zirconium(IV)iodate and polyaniline mixture was allowed to mix on stirring for 1 hour turned greenish black coloured slurry. The polyaniline zirconium(IV)iodate composite gels were filtered off and washed thoroughly with distilled water to remove the excess acid. The product was dried in air oven at 60 °C. The dried gel was put into the distilled water to obtain granules of uniform size. The washed gels were dried at 60 °C in an oven. The dried granules were converted into the H+ form by keeping them immersed in 1 M HNO3 for 24 hours with occasional shaking and intermittently replacing the supernatant liquid with fresh acid. The material thus obtained was then washed with distilled water to remove the excess acid before drying finally at 60 °C. Polyaniline Zr(IV)iodate nanocomposite ion exchanger and H+ form of conducting polymeric-inorganic hybrid ion exchanger were characterized by FTIR spectra, TGA, X-ray diffraction, SEM, and TEM analysis. FTIR spectra of composite ion exchanger were taken by KBr disc method at room temperature performed on Fourier transform infrared (FTIR) spectrometer from PerkinElmer (model 1730). Thermogravimetric analysis (TGA) was carried out on a DTG-60H C305743 00134 (Shimadzu, Japan) analyzer at a rate of 10 °C min −1 in a nitrogen atmosphere. The powder X-ray diffraction technique has been employed to identify the crystalline phases of the samples using An X’Pert PRO analytical diffractometer (PW-3040/60; The Netherlands, with Cu Kα radiation, λ = 1.5418 Å) The scanning electron microscopy (SEM) instrument (LEO, 435 VF) at various magnifications and a Jeol H-7500 microscope. the dry cation exchanger in H+ form was taken into a glass column. The bed length was approximately 1.5 cm long. 1 M NaNO3 solution were used to elute the H+ ions completely from the cation exchange columns maintaining a very slow flow rate of ~0.5 mL min−1 .The effluents were titrated against standard 0.1 M NaOH solution for the total ions liberated in the solutions using phenolphthalein indicator. To find out the optimum concentration of eluent for complete elution of H+ ions, a fixed volume (250 mL) of NaNO3 solutions of varying concentrations (0.1-1.2 M) was passed through a column containing 1 g of the exchanger in H+ form with a flow rate of ~0.5 mL min−1 . The effluent was titrated against standard alkali solution of 0.1 M NaOH for the H+ ions eluted out for the determination of eluent concentration using phenolphthalein as an indicator. A column containing 1 g of the exchanger in H+ form was eluted with 1.2 M of NaNO3 solutions of different 10_mL fractions with minimum flow rate of 0.5 mL min−1. 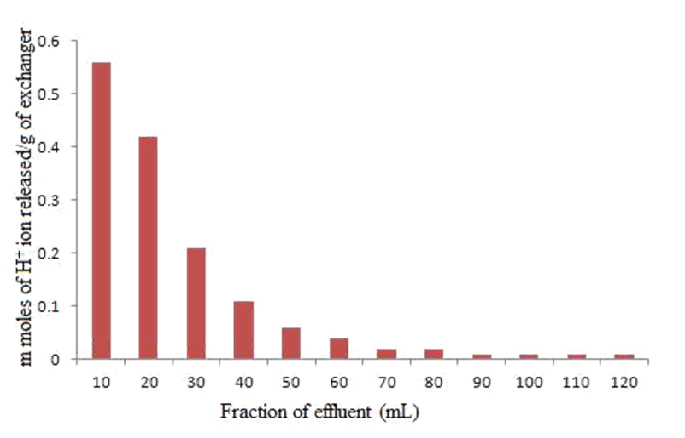 Each fraction of 10 mL effluent was titrated against standard NaOH (0.1 M) solution to determine the strength of H+ ions eluted out. The pH titration studies of PANI Zr(IV)iodate was performed by the method of Topp and Pepper . A total of 200 mg portions of the cation exchanger in the H+ form were placed in each of the several 250 mL conical flasks followed by the addition of equimolar solutions of alkali metal chlorides (LiCl, and NaCl) and their hydroxides (LiOH and NaOH) in different volume ratios; the final volume was kept as 50 mL to maintain the ionic strength constant. The pH of the solution was recorded every 24 hours until equilibrium was attained. The distribution behaviour of metal ions plays an important role in the determination of the selectivity of the material. The distribution coefficient (values) of various metal ions on cation exchangers can be determined as follows. 200 mg of the composite cation exchanger beads in the H+ form was taken with 20 mL (0.005 M) of different metal nitrate solutions and kept for 24 hours with continuous shaking for 6 hours in a shaker at 25 °C to attain equilibrium. The metal ions in the solution before and after equilibrium were determined by titrating against standard 0.005 M solutions of EDTA . The distribution coefficient is the measure of a fractional uptake of metal ions competing for H+ ions form a solution by an ion-exchange material and mathematically calculated using the formula where and are the initial and final amounts of metal ion in aqueous phase (M), is the volume of the solution (mL), and is the amount of cation exchanger (g). Organism culture and in vitro screening for antibacterial activity was done using disk diffusion method with minor modifications. Staphyllococcus aureus, Staphyllococcus epidermidis, Proteus mirabilis and Escherichia coli were sub cultured in nutrient agar medium and incubated for 18 h at 37 oC. The bacterial cells were suspended for incubation according to the McFarland protocol in saline solution to produce a suspension of about 105 CFU/mL. 10 mL of this suspension was mixed with 10 mL of sterile antibiotic agar at 40 °C and poured on to an agar plate in a laminar flow cabinet. Five paper disks (6.0 mm diameter) were fixed onto nutrient agar plate. One milligram of each test compound was dissolved in 100 ml DMSO to prepare stock solution. From the stock solution different dilutions of each test compound were prepared and poured over disk plate. Ciprofloxacin was used as a standard drug (positive control) and DMSO as negative control. The susceptibility of the bacteria to the test compounds was determined by the formation of an inhibitory zone after 18 h of incubation at 36 °C. The results were compared with the positive control and the zone of inhibitions was measured at the minimum inhibitory concentration (MIC). The minimum inhibitory concentration (MIC) was evaluated by the macro-dilution test using standard inoculum of 105 CFL/mL. Serial dilutions of the test compounds, previously dissolved in dimethyl sulfoxide (DMSO) were prepared to final concentrations of 400, 200, 100, 50, 12.5, 6.25 and 3.125µg/mL. To each tube was added 100 mL of a 24 h old inoculum. The MIC, defined as the lowest concentration (highest dilution) required to arrest the growth of bacteria, which inhibits the visible growth after 18 h, was determined visually after incubation of 18 h, at 37 °C, DMSO and “Ciprofloxacin” were used as negative and positive controls respectively. In the present study, novel organic-inorganic nanocomposite cation exchanger was prepared by sol-gel mixing of organic conducting polymer (polyaniline) into the matrix of inorganic ion exchanger, Zr(IV)iodate. FT-IR spectra are used as a tool to characterize the molecular structures of organic-inorganic hybrid ion exchanger. The FTIR spectrum of H+ form of polyaniline Zr(IV)iodate ion exchanger are given in Fig. 1. In the present study also, all the peaks represented above are observed in polyaniline Zr(IV)iodate nanocomposite ion exchanger (Fig. 1), but they are modified in both intensity and band position when the polymer is incorporated into the inorganic matrix of Zr(IV)iodate. The bands at 1871.82 cm−1 and 1624.5 cm−1 are attributed to C=N and C=C stretching modes for the quinoid and benzenoid rings, the peaks at about 1300 cm−1 and 1231 cm−1 are attributed to C–N stretching mode for benzenoid ring, and the peak at 1124 cm−1 is assigned to the plane bending vibration of C–H (modes of N=Q=N, Q=NH +–B, and B–NH +–B), and out-plane bending vibrations of PANI are reported to occur at about 800.027 cm−1 .Below 500 cm-1 peaks are responsible for metal oxides and iodate. It has been revealed that, after binding of polyaniline with Zr(IV)iodate, the morphology has been changed, and the average crystallite size of the composite material was found to be ~30 nm. The X-ray powder diffraction pattern of this ion exchanger suggests an amorphous nature of the composite material. Thus, it was confirmed from both XRD and SEM that the crystallite size shows the nanorange. TGA curve for polyaniline Zr(IV)iodate nanocomposite ion exchanger in nitrogen atmosphere are shown in Fig. 4. The results reveal a typical three-step weight loss behaviour. For polyaniline, in the first step, weight loss is seen up to 200 °C. This is attributed to the loss of water molecules from the nanocomposite material. The second weight loss starts at around 270 °C and ends at around 560 °C. This is attributed to possibly decomposition of the backbone of polyaniline as well as the low molecular weight fragments of the polymer and the decomposition of the polymer has been completed. The third step, starting from 325 °C onwards, represents degradation and large weight loss above 560 °C and the formation of metal oxide residue. 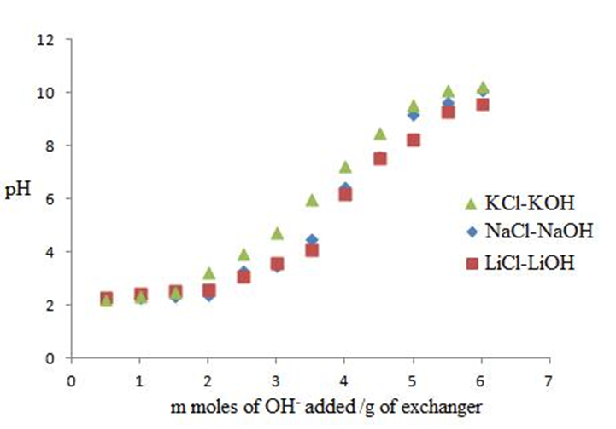 The ion-exchange capacity of the hybrid ion exchanger for alkali metal ions increases according to the decrease in the hydrated ionic radii [26-28] as evident Nachod and Wood have also given the similar observations for the exchanged alkali metal ions on carbonaceous zeolite. The maximum ion-exchange capacity sequence for alkali metal ions is K+> Na+> Li+. The size of exchanging ion affects IEC of polyaniline Zr(IV)iodate nanocomposite ion exchanger. Effect of alkali metal nitrate concentration on ion exchange capacity of polyaniline Zr(IV)iodate nanocomposite ion exchanger is presented in Fig. 5. The data revealed that the rate of elution increased with the eluent concentration. The highest rate of elution was observed with 1.0 M NaNO3 eluent for maximum release of H+ ions from polyaniline Zr(IV)iodate ion exchanger by using 1 g of the cation exchanger. The elution behaviour (Fig. 6) indicated that the exchange is quite fast because only 120 mL NaNO3 solution are enough to release the total H+ from 1 g of polyaniline Zr(IV)iodate cation-exchange material. 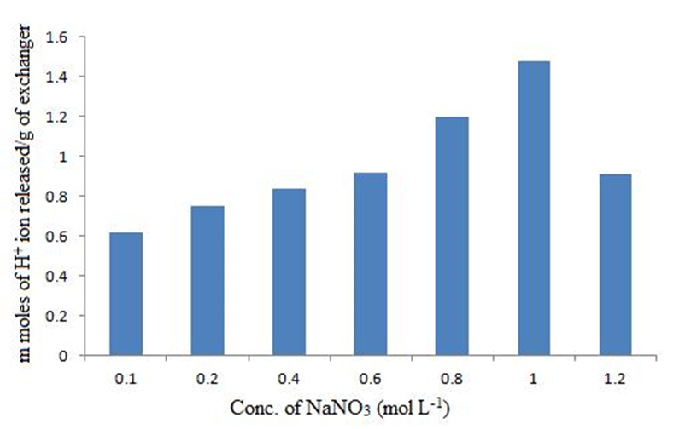 The pH titration curves for polyaniline Zr(IV)iodate nanocomposite ion exchanger were obtained under equilibrium conditions with LiOH/LiCl, NaOH/NaCl, and KOH/KCl systems indicating monofunctional behaviour of the material as shown in Fig. 7. At low pH, the weak acidic groups remain undissociated. The addition of LiOH, NaOH, and KOH neutralized the solution, and the weak acidic group dissociates; thus, the ion exchange starts toward completion. The pH titration curves showed a gradual rise in pH initially and a steep rise at the end because strong acidic groups were completely exchanged with Li+, Na+ and K+ ions at the end. The rate of H+-K+ exchange was faster than those of H+-Na+, and H+-Li+ exchanges. In order to find out the potentiality of polyaniline Zr(IV)iodate nanocomposite ion exchanger in the separation of metal ions, distribution studies for three metal ions were performed in four different solvent systems. The results of distribution studies (Table 1) show that value varies with the nature and composition of contacting solvents. It was also observed from the sorption studies (values) that the composite has a maximum selectivity towards Pb2+ than other metal ions like Hg2+ and Ni2+. In vitro antibacterial screening of polymer and nano-composite material was evaluated against gram positive (S. aureus and S. epidermidis) and gram negative (P. mirabilis and E. coli) bacteria using disc diffusion method and results were compared with standard drug “Ciprofloxacin.” Results revealed that the composite is found to possess better activity than the polymer against all gram negative and gram positive bacteria. Antibacterial activity was calculated in terms of zone of inhibition (measured in mm) and the minimum inhibitory concentration (MIC) was evaluated by the macro-dilution test using standard inoculum of 105 CFL/mL results are reported in Table-2. We also plotted the percent area of inhibition by composite against all microorganisms and compared it with standard drug Ciprofloxacin (Fig - 8). The characterization of polyaniline Zr(IV)iodate ion exchanger is justified on the basis of FTIR, TGA, XRD, SEM, and TEM. In the present study, all the bands of IR in prepared polyaniline Zr(IV)iodate nanocomposite ion exchanger are modified both in intensity and band position in compare to pure PANI and Zr(IV)iodate. XRD pattern of this cation exchanger shows that the composite material is in an amorphous form. The SEM and TEM studies show that the average size of the H+ form of composite material was found to be 30 nm. The thermal analysis points out the inference that prepared polyaniline Zr(IV)iodate nanocomposite ion exchanger is thermally stable. The polyaniline Zr(IV)iodate nanocomposite ion exchanger prepared by the sol-gel mixing, has good ion-exchange capacity compared to that of the individual ion exchanger like Zr(IV)iodate, which has the ion-exchange capacity of 2.2 meq./g. Polyaniline Zr(IV)iodate nanocomposite ion exchanger has good ion-exchange capacity towards different metal ions like Li+, Na+, and K+ to the extent of 4.2, 5.3, and 5.9 meq.dry g−1 , respectively. 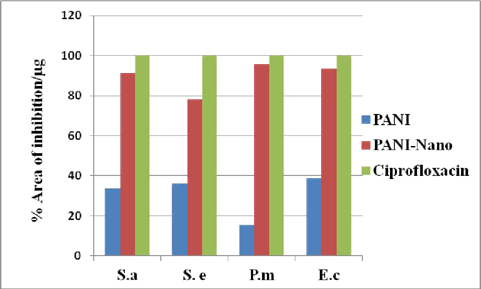 The distribution coefficient values from sorption studies show that polyaniline Zr(IV)iodate nanocomposite ion exchanger has a higher selectivity towards Pb2+ than towards Hg2+ and Ni2+; i.e., Pb2+ is highly adsorbed in all solvents while Hg2+ and Ni2+ ions are poorly adsorbed. Antimicrobial activity study shows that the organic polymer and nanocomposite ion exchanger are effective against Staphyllococcus aureus, Staphyllococcus epidermidis, Proteus mirabilis and Escherichia coli. The intrinsic multifunctional character of organic/inorganic hybrid materials makes them potentially useful in multiple fields. Artificial membranes for ultra- and nanofiltration adsorbents for toxic compounds, The most obvious advantage of organic-inorganic hybrids is that they have good ion-exchange properties, high stability, reproducibility, and selectivity for heavy toxic metal ions. In the present work, polyaniline Zr(IV)iodate is a newly synthesized organic-inorganic nanocomposite ion exchanger, which possess all such characteristics and is highly selective for lead, a hazardous toxic metal in the environment. Thus, the material can be used in making Pb(II) ion selective membrane electrode. The author would like to acknowledge the Department of Chemistry, Aligarh Muslim University, Aligarh, India. Fig. 1: Representing the comparative percent area of inhibition per µg of the composite and the Ciprofloxacin in case of gram positive and gram negative bacteria. Table-2: Representing the Inhibitory effects of composite on microorganism (Zone of inhibition in mm) and Minimum Inhibitory Concentration, Ciprofloxacin and DMSO were used as positive and negative control respectively. Table 1: Distribution coefficient values of some metal ions on polyaniline Zr(IV)iodate in different solvent systems. Fig. 4: FTIR spectra of the polyaniline Zr(IV)iodate. Fig. 6: Elution behavior of polyaniline Zr(IV)iodate ion exchanger. C. Zhong, K. Doblhofer, and G. Weinberg, "The effect of incorporated negative fixed charges on the membrane properties of polypyrrole films," Faraday Discussions of the Chemical Society, vol. 88, pp. 307?316, 1989. U. Schybert, N. Husing, and A. Lorenz, "Oxide gels and ceramics prepared by a nonhydrolytic Sol-Gel process," Chemistry of Materials, vol. 7, no. 11, pp. 2110?2114, 1995. J. Wen and G. L. Wilkans, "Organic/inorganic hybrid network materials by the Sol-Gel approach,"Chemistry of Materials, vol. 8, no. 8, pp. 1667?1681, 1996. F. Helfrich, Ion-Exchange, Mac Graw-Hill, New York, NY, USA, 1962. R. Kunnin, Ion- Exchange Resins, John Wiley & Sons, New York, NY, USA, 3rd edition, 1958. R. Schoolorn, "Intercalation systems as nanostructured functional materials," Chemistry of Materials, vol. 8, no. 8, pp. 1747?1757, 1996. Y. Wang and N. Herrom, "X-ray photoconductive nanocomposites," Science, vol. 273, no. 5275, pp. 632?634, 1996. S. Higashika, K. Kimura, Y. Matsuo, and Y. Sugie, "Synthesis of polyaniline-intercalated graphite oxide,"Carbon, vol. 37, no. 2, pp. 354? 355, 1999. A. A. Khan and M. M. Alam, "New and novel organic-inorganic type crystalline "polypyrrolel/polyantimonic acid" composite system: preparation, characterization and analytical applications as a cation-exchange material and Hg(II) ion-selective membrane electrode," Analytica Chimica Acta, vol. 504, no. 2, pp. 253-264, 2004. A. A. Khan, Inamuddin, and M. M. Alam, "Determination and separation of Pb 2+ from aqueous solutions using a fibrous type organic-inorganic hybrid cation-exchange material: polypyrrole thorium(IV) phosphate," Reactive and Functional Polymers, vol. 63, no. 2, pp. 119-133, 2005. G. Alberti, M. Casciola, C. Dionigi, and R. Vivani, in Proceedings of the International Conference on Ion- Exchange (ICIE '95), Takamtsu, Japan, 1995. J. C. W. Chien, Polyacetylene-Chemistry, Physics and Materials Science, chapter 2, Academic Press, San Diego, Fla, USA, 1984. P. Singh, J. P. Rawat, and N. Rehman, "Synthesis, characterization and 18. P. Singh, J. P. Rawat, and N. Rehman, "Synthesis, characterization and 18. P. Singh, J. P. Rawat, and N. Rehman, "Synthesis, characterization and 18. P. Singh, J. P. Rawat, and N. Rehman, "Synthesis, characterization and 18. P. Singh, J. P. Rawat, and N. Rehman, "Synthesis, characterization and Ion Exchange Ion Exchange. Properties of a New Inorganic Ion Exchange Materials: Zirconium(IV) Zirconium(IV) iodooxalate," Indian Journal of Chemistry A, vol. 41, p. 1616, 2002. W. A. Siddiqui and S. A. Khan, "Synthesis, characterization and ion exchange properties of zirconium(IV) tungstoiodophosphate, a new cation exchanger," Bulletin of Materials Science, vol. 30, no. 1, pp. 43-49, 2007. D. C. Trivedi, "Polyanilines in conductive polymers: synthesis and electrical properties," in Handbook of Organic Conductive Molecules and Polymers, H. S. Nalwa, Ed., vol. 2, p. 505, John Wiley & Sons, Chichester, UK, 1997. A. A. Khan and T. Akhtar, "Preparation, physico-chemical characterization and electrical conductivity measurement studies of an organic-inorganic nanocomposite cation-exchanger: poly-o-toluidine Zr(IV) phosphate," Electrochimica Acta, vol. 53, no. 17, pp. 5540-5548, 2008. N. E. Topp and K. W. Pepper, "Properties of ion-exchange resins in relation to their structure. 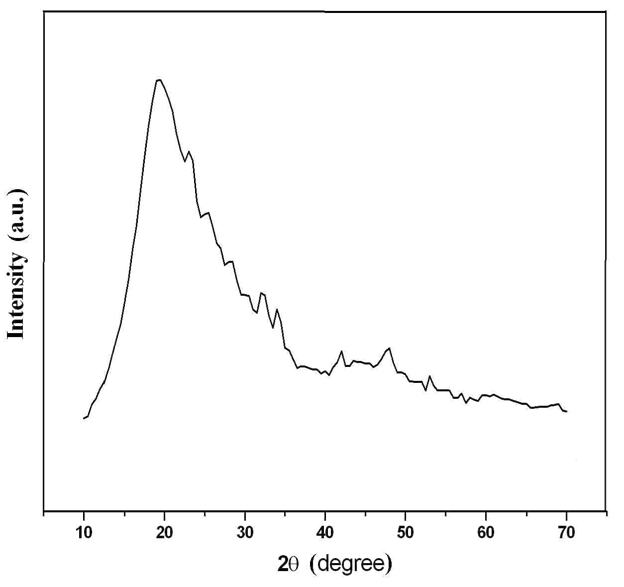 Part I. Titration curves," Journal of the Chemical Societ y, pp. 3299-3303, 1949. C. N. Reilley, R. W. Schmidt, and F. S. Sadek, "Chelon approach to analysis (I) survey of theory and application," Journal of Chemical Education, vol. 36, p. 555, 1959. J. P. Travers, J. Chroboczek, F. Devreux, and F. Genoud, "Transport and magnetic resonance studies of polyaniline," Molecular Crystals and Liquid Crystals, vol. 121, no. 1-4, p. 195, 1985. B. Lundberg, W. R. Salaneck, and LundstromI, "Pressure, temperature and field dependence of hopping conduction in polyaniline," Synthetic Metals, vol. 21, no. 1-3, pp . 143-147, 1987. J. P. Rawat and J. P. Singh, "Studies on inorganic ion exchangers. II. Synthesis, ion exchange properties, and applications of ferric arsenate," Canadian Journal of Chemistry, vol. 54, no. 16, pp. 2534-2539, 1976. F. C. Nachod and W. Wood, "The reaction velocity of ion exchange," Journal of the American Chemical Society, vol. 66, no. 8, pp. 1380-1384, 1944.